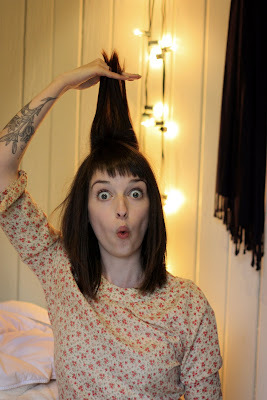 the velvet bird: A Giveaway, review, and straight hair! A Giveaway, review, and straight hair! Welp, my hairs straight! This is a very rare occurrence in the past year or so, but I used to straighten my hair all of the time. 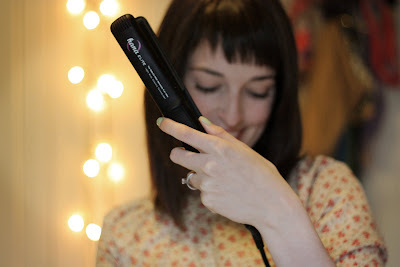 Recently I received a Hana Elite hair straightener to try out and review for you guys. I was excited about this because I've had a lot of good and bad experience with flat irons in my life. I sure wish I had had something nice like this when I was a hair straightening queen, my hair probably would've been a whole lot healthier! This little thing works so well! My hair felt really healthy and looked really shiny after using it. My hair was even straight and shiny the day after fixing it. Although the real test would've been how my hair held up to the south eastern Georgia summer humidity, but luckily that monstrosity is still a of couple months away. Now I understand that not everyone is in the market for a high priced hair straightener, but if you are I'd say this is one to consider. You can really feel the difference between a high quality straightener and a $30 one, I guess it could be seen as worth it for the damage you could save your hair from! The flat iron was sent by Misikko, who also have professional hair dryers, Babyliss flat irons, and Chi flat irons for sale. They also want to give one away to you guys! At a $230 value that is pretty exciting I say. So keep on reading to find out how to enter this humdinger of a giveaway. Please leave a separate comment for each entry you make. Please! This giveaway is open until next Sunday, March 28th and then I will announce a winner on Monday. Don't enter me because of being real life friends, buy Oh man, so many flashbacks of my AWFUL straight hair during those Davey Jones Locker days!! Man, we looked good! ;) I much prefer our cute curls these days! Oh, this is so exciting!! :D I desperately need a new hair straightener! The worst hair style I ever had was the frizzy, untamed, triangular 'do that I had during middle school. I didn't know how to straighten my hair yet, and it was just a disaster! Think Hermoine Granger in the 1st Harry Potter movie, but 10 times worse. Haha! My worst hairstyle, hands down, was early high school, when I convinced myself that my (then) beautiful blonde hair would look best pulled back slick straight into a ponytail every day! Thank goodness I've learned the importance of volume! well, i had 2 really really bad ones. i mean REALLY bad. in eight grade, my stylist accidentally cut WAY too much off on one side, so she ended up having to chop ALL of it off... my hair was shorter than a boys. i tried sprucing it up with little butterfly clips (so bad!) and worst of all.... it was the day before yearbook photos. awful! and then my senior year, at the beginning of the whole ~scene trend, i had a big huge huge section of my hair bleached (my hair was DARK brown) and the best part... it was at the crown of my head and when you pulled up all the blonde hair, it was in the shape of a giant star. SERIOUSLY?!!?! yes, i so did that. joined the misikko mailing list! I joined the misikko mailing list! Wow, I straighten my hair on a daily basis so I reallyyyy need this! I use one of those really cheap ones. The worst hair style I've ever had... hmm. Well one time I had gorgeous, really extremely long hair. Then I cut if ALL off, and it did not look good on me. 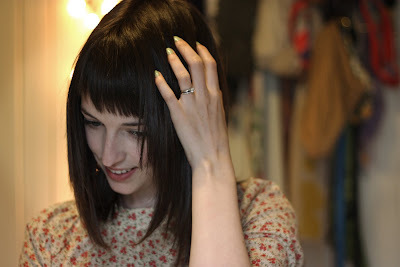 I was a natural blonde at the time, and I decided that I wanted to go darker. So I dyed it (myself) this reddish-brown color... and it turned my hair PURPLE. I was called a clown for sooo long after that, it was horrible! My worst hairdo was when i was about 11 - i pulled my hair back into a pony but left 2 bits out at the front. they hung down over my face...and then i decided to feature them by dying them platinum blond. Oh the shame. Probably the time my hairstylist looked at the wrong picture when cutting my hair...and didn't even do that right. 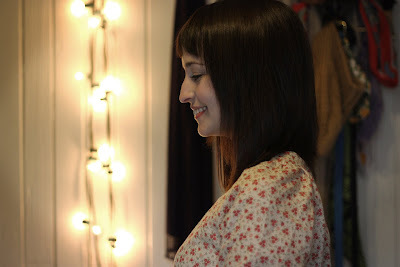 The back of my hair was so short and not in any way even...and the front wasn't much better. Plus she cut one section really short, I suppose it was her version of side bangs, but it looked like my 3 yr. old niece did it. It was horrible! I posted the link on twitter. As for my worst hairdo experience...I'm gonna have to go with my bangs. I love having bangs even though I am trying to grow them out for once. However, even so I never know how crazy they'll be when I wake up in the morning. My hair used to be more pin straight when I was younger, but now it takes more of a full (shall I dare say even 'fluffy') shape, especially after my showers. It's lame because I want it to just lay flat and straight. I even have some waves in there now. So having that and bangs that don't cooperate...not good. It's not a specific worst hairdo story, but it's my constant battle! I am also now following Misikko on Twitter! Just signed up for the newsletter too! Thanks again for having this great giveaway! My dad used to take my sister and I to the barber with him when he would get his hair cut. We would always wind up with short, spiky bangs that we thought were SO cool-yuck. Never really had awful hairdos. Maybe the short spikey in the back hair I tried once. the worst hairstyle i've had was a mullet, which i gave myself a couple of times when i was little because i was so intrigued by scissors i just wanted to cut my hair! lol i was about 5 at the time! haha! I signed up for the newsletter!!! I also tweeted!! (@mybeautifulone) P.S. your hair looks super cute straight! love it! I had a really super short haircut. Like boy style, and it was bright freaking red. Most people thought I was a boy; it was definitely the worst! and I am now getting your newsletter. I agree with Mandy. Your hair rocks, and I have never had a non-15 dollar straightener, haha. Awww, man. I had hoped the giveaway would be for one of your crafted items and not a haaaaair straightener! I'm far too dumpy to get excited over a primping gadget. Haha. P.S. - Does Patrick still lovingly refer to you as "fatback?" P.P.S. - I put together a little package for you quite awhile ago, but still haven't mailed it. I'm just going to forewarn you that said package contains a cookie. Or an object that was once a cook. 8| So look out! Object that was once a cookie. Not an object that was once a cook. Ugh. rock on, what a great giveaway! and your hair looks pretty like that! by far my worst hairstyle ever was bright blonde highlights with dark, dark hair in high school. I wore a lot of preppy abercrombie t shirts and jeans.. really boring stuff! that was when I thought you weren't attractive if you didn't have some blonde in your hair. I must have looked like a zebra. at one point I would have said my worst hairstyle was a bowl cut in kindergarten, but now I think they're kind of cool. Really hope I get this one! The summer before I started seventh grade, I had thick, waist-length blonde hair. I went to the salon to get a perm (I know, I know) before school began. For some reason, the stylist did the perm, but then flipped my chair around and started snipping. She said that a perm needs layers, but she just kept cutting and cutting, and before I knew what was going on (she'd flipped my chair around to face her, so I couldn't see the mirror any more), she was holding CLIPPERS. She ended up- seriously- shaving my head. I ran out bawling. Needless to say, junior high, at least hair-wise, totally sucked. oh wow count me in!!!!! my worst hair style was probably my first year of high school, i was around 13 years old and i didnt know how to straighten my hair so i'd make my mom dry it out with this round brush and then iron it, but the ends got all messed upand i got so tired of it that i dyed it red.........and then it was just a big dry not quite straight, still frizzy red mess of ugly! p.p.s. I'm following the twitter! p.p.p.s. (does that exist?) i joined the newsletter! The worst hair style I had was when I got a perm in 5th grade. I don't know WHY my mother allowed me to get it but I envied curly hair so I really wanted it. But it was WAY to curly and my hair dresser told me I looked like an indian shirley temple, I cried. Horrible. My worst hairstyle was a self-Shirley Temple do I tried to do to myself in eighth grade! I looked crazy! I posted about the giveaway! Hope it brings you more readers! My worst hairstyle was.. when I used to let it go naturally curly and cut it into a bob.. and I had no idea how to handle it! It was like a triangle on my head! I once had a reverse frost where they tied the top black and the underneith white blonde..it came out orange and I looked like a burnt pumpkin! My worst hairstyle was when I cut my own bangs with kitchen scissors! They were incredibly crooked and super short! I would love such a great straightener! Your hair looks so cute straight! P.S. I joined the newsletter too! worst hair experience? living in germany, being asked in german if i also want my bangs permed (what? it was 1983, people), and saying timidly "yes please..." frizzy, poofy, hideous disaster.